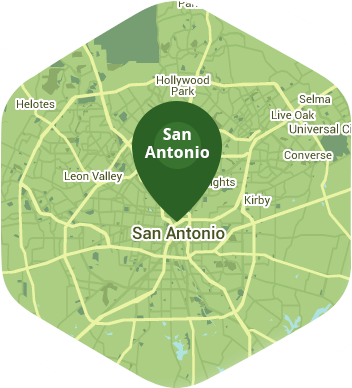 Book a skilled lawn pro in San Antonio. Backed by a total satisfaction guarantee and amazing customer support. San Antonio, TX is one of the nation's fastest growing cities and is home to the world famous Alamo and the breathtaking River Walk. It is a great place to live in and work in, but sometimes you can't help but just want to spend your free time enjoying the city with your friends instead of aerating your lawn. Enter Lawn Love, one of San Antonio's best lawn aeration providers. Lawn aeration is something that needs to be done regularly so your grass can continue to grow, thrive, and stay healthy. Lawn aeration is similar to cleaning out your coffeemaker or closet whenever it becomes full of unnecessary clutter. Aerating your lawn helps reduce soil compaction and can make the grass greener and lusher. Our technicians at Lawn Love each have an average of 10 years of experience and are familiar with the grass types, pests and seasonal challenges in the San Antonio area. We believe we are the best choice when it comes to caring for your lawn and we are more than willing to prove it. We offer our clients a full satisfaction guarantee meaning if something isn't done right, your lawn pro will come back to your home and fix it for free! Take advantage of our quick booking service by calling us at 210-802-4223 or get a free quote online to receive a price estimate. He got the job done! Cory is friendly, communicates well, knowledgeable and we love the service. Thank you so much for taking care of us yesterday! Stuck with it even though it was rainy cats and dogs. Thanks! My Lawn Pro did an awesome job on my yard. I look forward to continue using this Lawn Pro. Thank you! Our lawn has never looked so perfect!!! Not one weed was left on the lawn! Trimming was great!! Mowing was exceptional!! This guy was VERY PROFESSIONAL AND DID A FANTASTIC JOB!!! He did an amazing job! I was concerned because I was unable to be at my home but he did everything I requested and more. I would highly recommend. Did a fantastic job and we are very satisfied! Aurian always does an awesome job every time he does my lawn. He's a pro at his job. I'm glad that Aurian is the one who does my lawn. Very proffessional and knowledgeable. Also very polite. A real top notch job, worth every penny! I told Juan that I like really clean edges around the yard and around the house and he did exactly as reqested. You always do a great job on my lawn! Excellent work and great communication! And it looks great. Thank you. This last lawn service was great!! So much better than what I have got previously. My lawn looks incredible, I dont ever leave feed back on things, but this was so good I needed to let someone know. Really good work guys! Excellent, I would love work again with this pro. Aurian Medina did what I ask for. Aurian did an awesome job on my lawn. He did everything I've asked for. I'm happy that Aurian will be my future lawn pro from this day on. Aurian is a very professional person! Cory was very professional and took his time and did a great job!! You always do such good work, thank for for making my lawn beautiful again! Awesome provider. Always keeps me informed of what's being done. Thanks for the great job. My yard looks great!! Thank you so much! Rodney was amazing. A real asset to lawnlove. I was surprised that the purple sage looks so much better. Thank you. My yard looks great. He always does an amazing job! My father is visiting from out of town and even noticed what a great job they did! Rated 4.77 / 5 stars in 7,267 San Antonio customer reviews. There won't be any rain in San Antonio today, which means you'll probably have to water your lawn. Dusk and dawn are the best times to water your lawn (the sun will rise at 7:04 AM and set at 8:02 PM today in San Antonio). Here are some average aeration prices for homes in San Antonio.